This is a retelling of the film ‘Falling Down’ in the Big Meg. It passes the time but we have seen Futsies before and this adds nothing new. A double whammy in the return of both the Dark Judges and Anderson. The Dark Judges represent a tangible threat to Dredd and the Mega-city unlike the regular criminals that pop up most weeks. Anderson is also a great foil for Dredd by being his emotional opposite. This story sees the mythos expanded as we journey to the Dark Judge’s homeworld. Like the last encounter there is a satisfying and credible conclusion to this latest chapter. Bolland does a superb job and is the perfect artist for this story. His mastery of contorted, terror-filled expressions is perfect and brings a real sense of action to the page. There is a wonderful double page spread of all the Dark Judges too. This is a collection of stories, each focussing on a different form of organised crime. It does a great job enriching Mega-city culture and accomplishes some great world-building. Many of the stories are cool sci-fi ideas that show you criminals of the future are just as devious as those of today. It is nice to revisit previous themes and characters; Uncle Ump, Psi-division and face changing machines all make another appearance. This is one of those stories that balances entertainment with social commentary so wonderfully that neither dominates your enjoyment. There isn’t a black and white enemy or criminal you can point at and boo. Rather, this lifts up the rock of society and lets you see the grime underneath. The lovely lines and clever shading of Gibson do a great job to illustrate the point. This is a wonderful story that says so much about our society, both that of the 80’s and thirty years on. There are many variations on the saying “All that is necessary for evil to triumph is for good men to do nothing.” Here we see that premise in action with citizens hoping others will be the victims of crime so that they may be spared. The rest of the story is bland action strip but this poignant message really resonates. 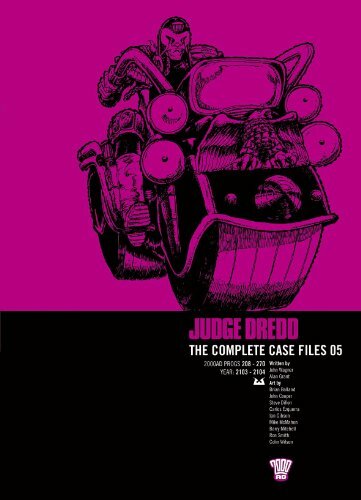 Dredd is tasked with showing an alien journalist around the Mega-city and told to be a bit more civil, what could possibly go wrong? The brevity of the story means there is no time to do anything interesting although the alien’s hyperbolic scribblings are quite amusing. You can guess how it ends. Funny aliens, like talking animals, are a bit of a mixed bag. 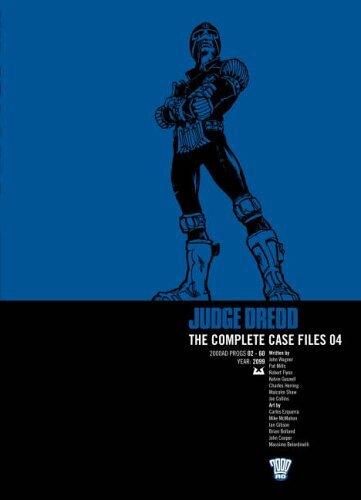 They tend to blunt the sci-fi edge that Dredd has when just played for laughs as they are here. Off planet or with a purpose, like the Kleggs, they can make a positive contribution but in this case, not so much.